Best French Onion Soup Recipe with fewer carbs. I only have ONE French onion soup recipe because it’s the only one that really surpasses all other variations I have tried. I’m not saying I won’t experiment with other onion-based soups, but in my world this one is the best. I don't mess with it! Onions are high in carbs so I'd recommend this soup for people who have a higher threshold for carbohydrate. Of course omitting the slab of bread reduces the carb count right off the bat. I have it seldom because my personal carb tolerance for a day hovers around 20 grams. This soup makes 4 very rich servings. 1/4-cup Madeira, which is a fortified wine and tastes way better than sherry. 1 cup of shredded Gruyère or Swiss cheese – I prefer the Gruyère for this soup – and for Pete’s sake don’t ruin it with mozzarella. I love mozz but not on French onion soup. It’s just wrong. 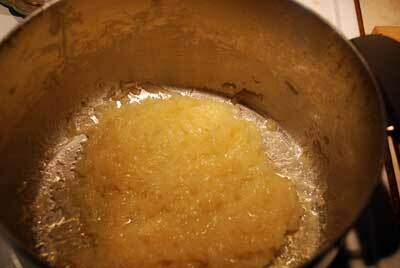 In a large saucepan, heat the butter and the olive oil over medium heat. Add the onion slices, sprinkling with the sugar substitute. Stir to mix. For 30 minutes over medium heat, cook the onions until they’re really soft. 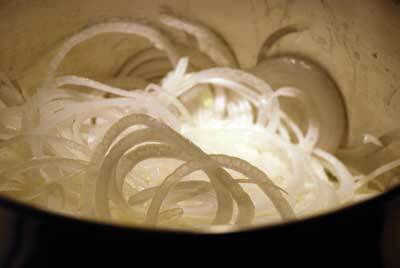 At this point keep an eye on the onions and stir from time to time until they turn a golden color. They will have reduced in volume considerably. The whole house and you will smell of cooking onions. Yum!! Now add the stock, bring to a boil, reduce the heat and simmer uncovered for another 30 minutes. Then you add the Madeira. I don’t feel a need for salt and pepper at all in this recipe. Ladle the soup into 4 individual ovenproof bowls and sprinkle with cheese, 1/4-cup each. Place the bowls about 3-inches from the broiler and watch as the cheese melts and turns golden brown. Ta da!! I hope you enjoy this French onion soup recipe. I promise you won't miss the bread! I find that it's a very satisfying soup. However, for me, the higher carb content means I'll be hungry again in a couple of hours, such is my sensitivity. When that happens I grab a quick high fat snack like a small handful of macadamia nuts. Let's go from French onion soup recipe back to the Home page.